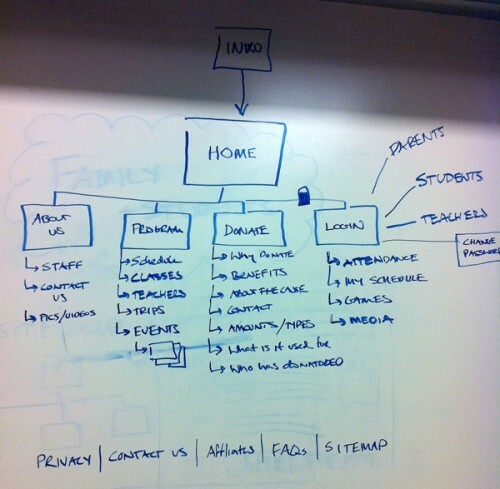 In our third class, we started by discussing what makes up a website: Content and Structure. 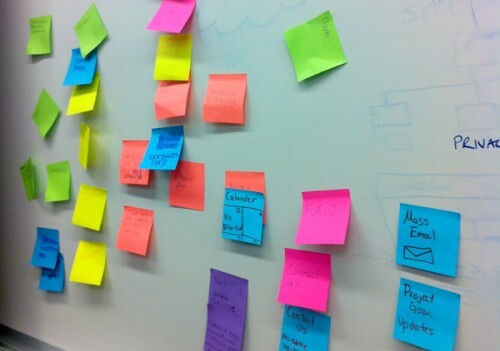 As a group we discovered we needed to decide the content (at least broadly) in order to get to the structure, and I introduced the tools of sitemaps and wireframes to the girls. For our first exercise, the girls – armed with their research – started by brainstorming the types of content and features they could see on the website. We took turns sharing our ideas and each girl would cluster her ideas near those similar that had been already shared. After a quick tutorial on sketching interfaces for websites each student chose 3 ideas to draw out and share back to the group. Anxious to get markers in their hands to see what came out, I was excited to see that their ideas were well formed, detailed and thoughtful. I knew they were ready to make a sitemap. Armed with all our pictures and post-its filled with content and feature ideas we started to sort them into buckets and fill out our first draft of a sitemap. What a great opportunity to talk about the difference between content and form! They quickly grasped this concept and all agreed the visual design must wait until we are sure of the content. More to come… one week at a time!